From Fox News: A South Carolina mother-of-three took action after she heard a man attempting to break into her home – and shot him. Ashley Jones of Anderson County told FOX Carolina she heard someone banging at her door early on Thursday (last month). The mother said she called 911 and got her gun. She said she saw a man banging at her door when she peered out the window. She said she used her gun after the intruder kicked her door in to come inside the home. Video surveillance outside her home captured the incident. The mother said she “would’ve killed him if I had to” if the intruder tried to come inside her home. She said she was thankful she had protection because she didn’t think she could fight off the man. “Because if I didn’t have any kind of weapons I don’t know what I would have did. That guy was kind of big,” she said. “I wouldn’t have been able to fight him off. I never thought I would have to shoot that gun, ever,” she continued. The Anderson County Sheriff’s Office said the suspect was taken to a hospital with non-life-threatening injuries. The suspect was later identified as Cecil Charles Parnell, 42, of Anderson, was charged with first-degree burglary and was booked in the Anderson County Detention Center, FOX Carolina reported. The woman who was with the suspect during the incident was not charged, the Anderson Independent Mail reported. 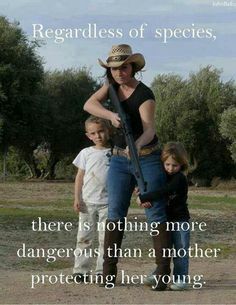 “Any mother is going to protect her kid any way she can. And that’s what I did,” Jones told WSPA.